Well, the day has come. Today is the last full day that NASA’s Cassini spacecraft will exist, and in fact right now it is on its final path—a grand soaring arc that will send it down into the atmosphere of Saturn itself on the morning of Friday, Sept. 15. It will be the closest to the ringed planet any spacecraft will have ever gotten, but it’s a trip that Cassini will not long survive. It’s the long-planned end of a glorious mission of exploration and discovery—not to mention beauty, art, and inspiration—and while Cassini itself will soon be gone, the enormous amount of data it has gathered in the twenty years since its launch will continue to drive discovery for many, many years to come. Cassini (and its onboard Huygens probe) launched on Oct. 15, 1997 aboard a Titan IVB rocket from LC-40 at Cape Canaveral AFS. Over the next several years it traveled in increasingly-larger loops around the inner Solar System, gaining velocity by passing through the gravity wells of Venus (twice), Earth, and then giant Jupiter (on Dec. 30, 2000) before finally arriving at Saturn on July 1, 2004. Over the next 13-plus years Cassini explored our Solar System’s extravagant and enigmatic ringed planet and its amazingly diverse family of icy moons. Across multiple seasons at Saturn Cassini collected over 600 gigabytes of data, took hundreds of thousands of images, and allowed scientists around the world make discoveries like no mission ever could before. Discovering new moons? Cassini did that. Putting a lander on the surface of Titan? Cassini did that. Flying between Saturn and its rings? Cassini did that. Capturing an image of Earth from Saturn? Cassini did that. 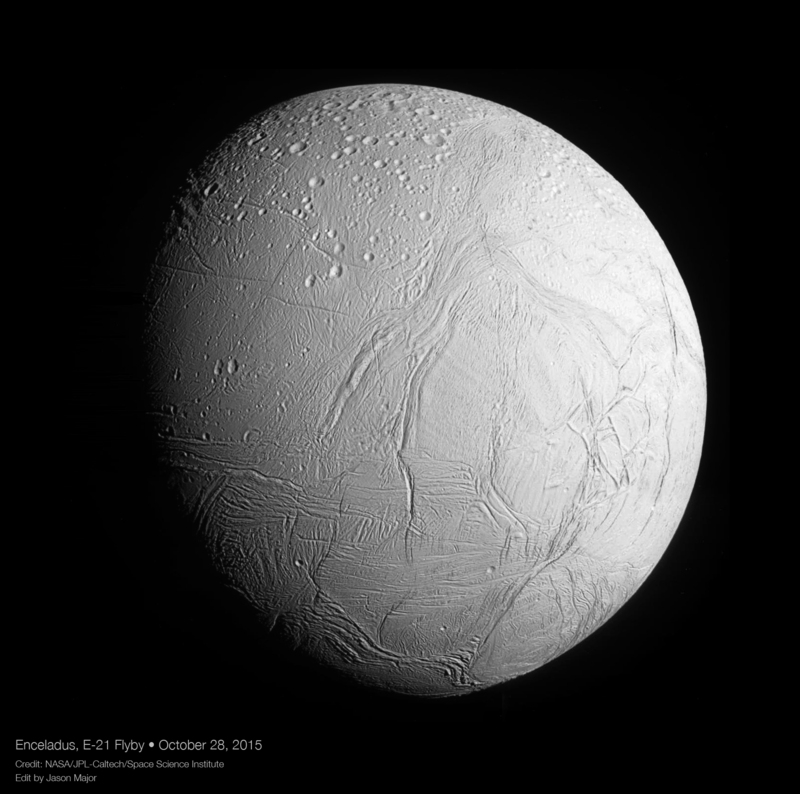 Discovering a subsurface salt-water, organics-rich ocean within—and spraying out from—the moon Enceladus? Cassini did that. In fact if you want to see what Cassini has done over the years, just spend a few hours browsing through my posts on Saturn or checking out the extensive Cassini imaging diary by the CiCLOPS imaging team. There’s just so much to see! But even though Cassini is powered by plutonium it still has a limited amount of propellant to steer its orbits around Saturn…an amount that is nearly depleted. And so, rather than risk an uncontrolled and potentially contaminating impact with Enceladus or Titan in the future by a wayward spacecraft, mission controllers decided to go for a “Grand Finale” dive into Saturn itself to close out the mission. 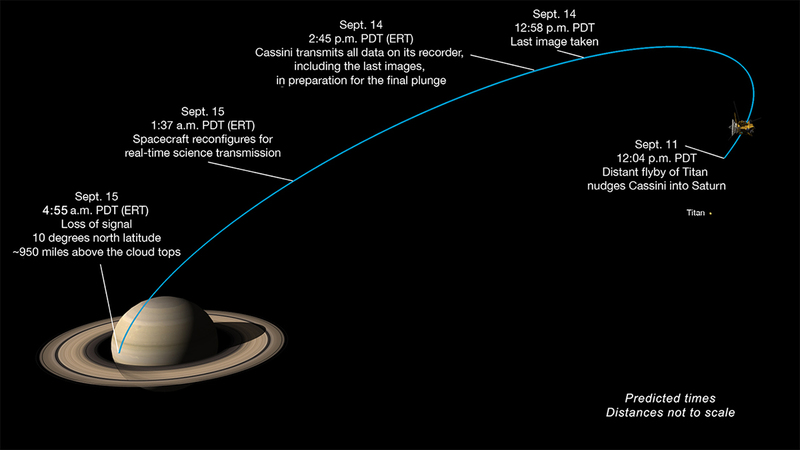 Cassini is en route on that dive right now, after one final nudge from the massive moon Titan earlier this week, and it will end with a disintegrating 70,000 mile-per-hour splash into Saturn’s upper atmosphere at 6:31 a.m. EDT / 10:31 UTC on Friday, Sept. 15. Cassini’s final signal will be sent a minute later. By the time it is received on Earth an hour and 20 minutes later Cassini will be gone, all 2.75 tons of it having become a permanent part of Saturn. Today Cassini will download all of its onboard data and images to Earth in preparation for its descent. While it will be transmitting science data up until its final moments its last picture will be captured today, about 14 hours before atmospheric entry. 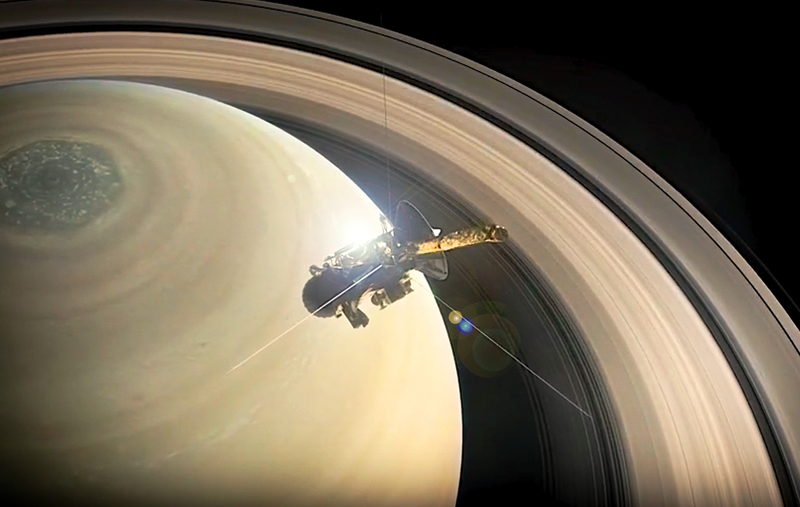 Learn more about what will happen during Cassini’s Grand Finale dive into Saturn here. “You could think of Cassini as becoming the first Saturn probe,” said lead scientist Linda Spilker during a news briefing on Sept. 13. 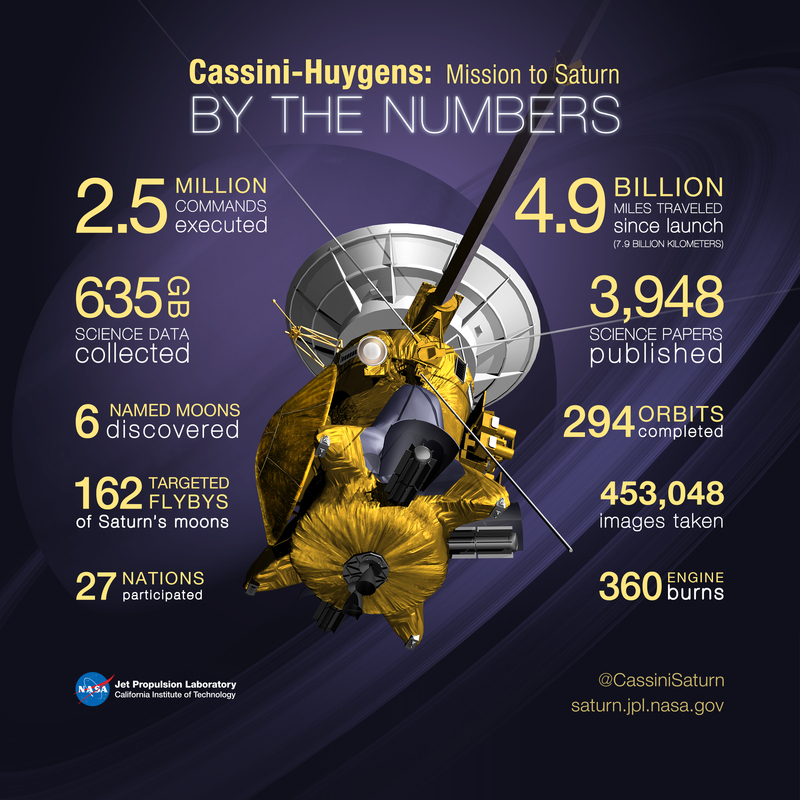 While the end of Cassini is certainly sad, it’s important to remember that it has been nothing but an enormous success across the entire lifespan of its mission as well as a testament to the power of human ingenuity, dedication, and collaboration. Cassini has shown us not only Saturn but also what we can achieve when we work together in the name of science and discovery. We must continue on that path, just as we must continue further into space. Goodbye Cassini, and thank you for all the science. Watch NASA’s news briefing on the end of the Cassini mission from Sept. 13, 2017. NASA’s coverage of the end of the Cassini mission will be live-streamed from Jet Propulsion Laboratory in Pasadena, California beginning 7 a.m. EDT / 4 a.m. PDT on Friday, Sept. 15. Watch here or right here on Lights In The Dark. See a “Hall of Fame” of Cassini images here. Cassini has been a fantastic mission! I couldn’t believe this when I read it early today through Nat Geo. I don’t think most people realize what goes into these missions. Pingback: It’s Time to Say Goodbye to Cassini — Lights in the Dark – Moody Much?